An old friend was just forced into mandatory retirement. Though still sharp as ever, he was deemed to be worn down. But we know he’s still got some lead left in him, and we’ll no doubt hear more from him in a future role. There’s also a new cohort just starting. Also triangular, they have unfinished ends, and act like they were made for work. Hailing from the venerable Mitsubishi Pencil Co., the 4563 in 2B lays down an incredibly rich, smooth, dark line. The shape is a rounded equilateral triangle, and if the pencil went back to complete its cap and get a more sophisticated colour, it would be able to compete with the best in the field. Arriving half green and half yellow, they quickly impress, and will no doubt get the sort of use that will also push them towards retirement soon enough. These look awesome, do you know where I can order these? Heck, I would love to try out any of the Mitsubishi pencils. I also have a box of these pencils and like them too – they are nice, simple and of high quality. I was curious about the imprint so I pulled out some books, a magnifier and looked closer. As far as I know now the word with the signs in squares (shown in the last but one photo) reads: ???????? (“kakikata enpitsu”) which means “way of writing pencil” or “how to write pencil”; I assume that this is similar to “pencil for beginners of writing” (the instructions on the back of the box make me believe that too). On another side it reads ??? (“namae”) which means “name” so I assume that this side is meant for the name of the child. Izzy: I found them at eBay.com. Hi Gunther, thanks for this contribution! It is an excellent pencil with very good price. My personal opinion, I feel that it is better than the Grip 2001 from FC. The graphite is so smooth easy to sharpen and give good shape of the point. 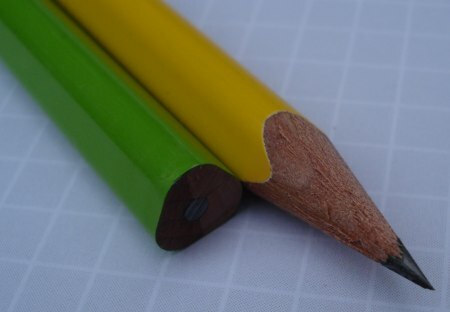 Have you seen these pencil holders that give a new lease of life to short pencil stubs?